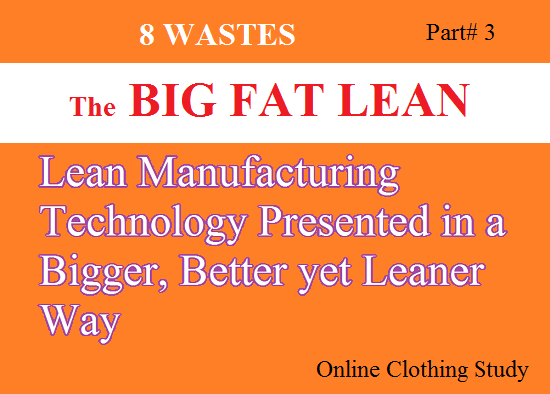 Today’s part covers various wastes of Lean Manufacturing. Lean considers 8 types of MUDA (waste) which need elimination, in most operations. If you think of setting up lean culture in your organisation, you have to work on reducing these 8 wastes. You might be already aware some of these waste. Different authors coined the waste in different terms. As per my study I found following terms of eight waste mostly used. I have explained 8 wastes with examples of garment manufacturing industry. Wasted motion has both human and machine element. This negatively affects productivity, quality and safety. Human motion waste is observed most of the times when operators or/and line supervisors carry parts or panels from tray and hand it over to the next operator. This can be eliminated by placement of a tray appropriately where the operators, both preceding and successive can have easy access to. Occurs when worker waits for material to be delivered or employees stand around waiting for a machine or a part. Delays increase lead time. Some operations like marking and cutting (sleeve mark and cut for example) take real long time than sewing the panels. This leads to waiting for the subsequent operations, resulting in increase of lead time. Caused by inefficient workplace layout, overly large equipment. Conveyance is a necessary Muda, since obviously materials have to be moved through factory, but it should be minimized. Transportation of cuttings from cutting department to sewing department and sending stitched garment to finishing departments are kind of waste as per lean theory. Related to having to fix defective products. It comprises of material, time and energy costs. Some operations like gathering and flaring if not precisely done, like setting of SPI appropriately, demand a lot of correction. Fatigue also is a factor which results due to correction and contributes to costing. Related to doing more than required by the customers. Keeping unnecessary raw materials, parts and WIP. A case of push system, Just-In-Case, as against Just-In-Time. This affects costing exponentially. This is the root cause for other kinds of 'MUDA'. Related costs to this are -buildings and maintenance of large warehouses, extra workers and machines, parts, materials energy, oil, electricity, extra, forklift etc. Disconnects inhibit the flow of knowledge, ideas and creativity, creating frustration and missed opportunities. Disconnects can be within a company, between companies and its customers and suppliers. In the next post we will discuss 5S Systems. This is a guest submission by Vijayalaxmi Meharwade. 8 Wastes of lean manufacturing.